Our 6-year-old daughter loves "bowl food" dinners. I don't know what spawned this passion, but it's one I've embraced wholeheartedly. Why? As a busy mom, even one who works in the food world, I often find myself at a loss for what to make for dinner. I want it to be nourishing, it needs to be pretty (my mom taught me to "eat a rainbow" at every meal), but most importantly I want it to be something my family will love eating. "Bowl food" fits the bill, plus it's fun to have your whole meal in one cozy vessel. When I came across BOWLS OF PLENTY: Recipes for Healthy and Delicious Whole-Grain Meals by James Beard award-winning author Carolynn Carreño I knew I'd hit the dinner dilemma-solving jackpot: more than 75 internationally inspired recipes for every meal of the day, all of which are convenient, flexible, satiating, and gorgeous. Each one-dish meal is filled with layers of wholesomeness starting with a grain, then followed with colorful veggies and meats, and more. 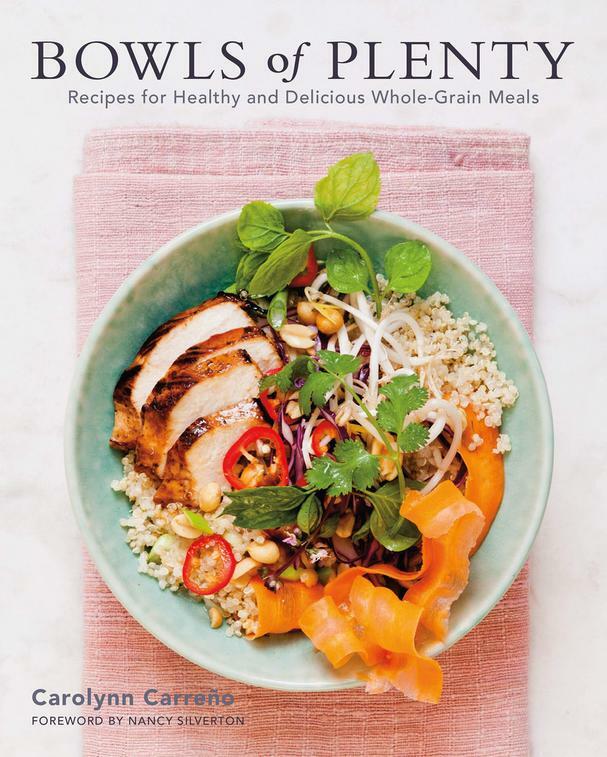 It's a cookbook for everyone on every diet as each inventive recipe can easily be made meatless, gluten or dairy-free, so the combination possibilities are virtually endless. Start your day with a Spiced Apple Breakfast Farro bowl or the Four Grain "Nutella" Porridge if you have a cocoa craving. I love the Huevos Rancheros Bowl for any meal of the day, and the Salmon Poke with Edamame bowl is a huge hit with my whole family. Carolynn even has a dessert bowl section where she tantalizes your taste buds with delights like her Flourless Chocolate Teff Cake (teff is a tiny nutrient dense grain loaded with health benefits). 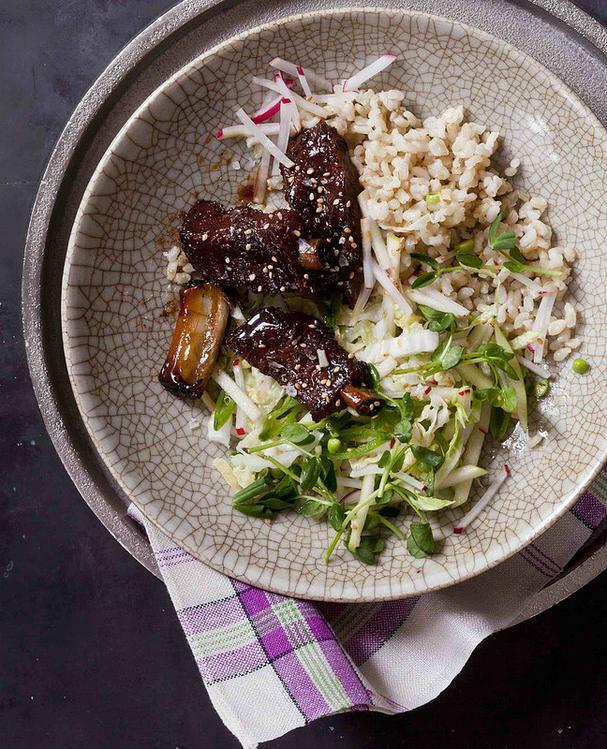 Try her Five-Spice Riblets with Sticky Rice and Apple Slaw recipe below for dinner tonight and be wowed by the flavor! Be sure to also get the Coconut Curry Rice Bowl with Green Vegetables and Sweet Potatoes recipe! Cut between each bone to create individual riblets. Combine the vinegar, mustard, sambal, ¼ cup of the maple syrup, and ¼ cup of the molasses in a glass or ceramic baking dish or zip-top bag. Add the ribs and turn to coat them with the marinade. Cover the baking dish or close the bag and put the ribs in the refrigerator to marinate for at least 1 hour and as long as overnight. Adjust the oven racks so one is in the middle position and preheat the oven to 350°F. To make easy cleanup, line a baking dish with aluminum foil. Make sure there are no tears or open seams in the lining; otherwise, the sticky stuff will leak onto the baking dish, which will cause the foil to stick to it. Remove the ribs from the marinade and put them bone-side down on the foil-lined baking sheet. Pour the marinade over them and season the sides facing up with the five-spice powder and salt. Cover the pan tightly with foil and bake the ribs for 1¼ hours. While the ribs are cooking, stir the remaining ¼ cup maple syrup and molasses together in a small bowl. Remove the ribs from the oven and remove the foil; be careful, as steam will rise from the pan. Baste the ribs with the maple-molasses mixture and return them to the oven, uncovered. Bake until they are sticky and glazed looking, turning the ribs with tongs to coat them in the liquid a few times during the process; this will take anywhere from 10 to 30 minutes, depending on how much liquid is in the pan. Keep an eye on it, as the liquid can go from sticky and delicious to burnt pretty quickly. To serve, pile the slaw into four or more bowls. Remove the ribs from the oven and serve them piled up on the bowls of slaw. Sprinkle the ribs with sesame seeds and serve. "Who doesn’t love a good slaw? This one contains sticky rice, so it does double duty as a grain base for yummy sticky ribs, and a salad. It requires a lot of slicing. If you’ve been meaning to buy a mandoline, now is the time." Put the rice in a big bowl. Add the cabbage, sugar snap peas, radishes, apple, pea shoots, and sesame seeds. Drizzle half the dressing over the slaw and toss to mix everything together. Add more dressing if you think the slaw needs it. Excerpted from the book BOWLS OF PLENTY by Carolynn Carreño. Copyright © 2017 by Carolynn Carreño. Reprinted with permission of Grand Central Life & Style. All rights reserved. Photograph above by Beatriz da Costa.